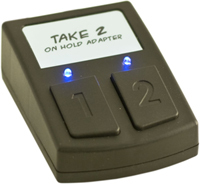 We recently found a great little item that allows small and home offices with single-line and two-line phones to add a professional Message On Hold. This MOH adaptor gives you the ability to place people on hold directly by pressing the “1” and “2” buttons (for lines 1 and 2 respectively). Virtually all Small Office / Home Office Phones have no ability to add a MOH (music on hold) input. They have what is known as “electronic hold”. This means when the Hold button is pressed on the phone, people are placed on hold but hear… absolutely NOTHING. That can prove to be deadly as people tend to hang up after a very short while in these situations, either believing they may have been hung up on or just feel they can spend their time more wisely and re-connect with you again later. Later may never come as they might find someone that will deal with them immediately at another supplier! The Message On Hold adapter is placed between the wall jack and your 1-2 line phone and all you need to do is add a Message On Hold system player with a custom message production and “voila” your callers will be listening to useful information about your business instead of silence. Telephone Magic offers a great start-up package which includes a USB Message On Hold unit and a fully customized message production about your company. The best part is there is currently introductory offer with a “recession buster” discount to get you up and running as easily and einexpensively as possible. This offer applies to all businesses, and small office / home office clients need only add the Message On Hold adapter to complete the package. Installation of the Message On Hold adapter is a snap – instructions are on the product page of the Telephone Magic website – and don’t worry about figuring out what to say on your message as the production team at Telephone Magic has been assisting it’s customers with scripting for over 20 years. This entry was posted in 1-line, 2-line, home office, message on hold, message on hold system, MOH, MOH adapter, MOH hardware, MOH unit, on hold message player, on hold messages, phone message, small office on July 7, 2009 by jjackson.